Demand for casting and splinting has significantly risen in the last few years, bolstered by the increasing incidence of sports, orthopedic, and musculoskeletal injuries. The aged are more prone to injuries, hence growth witnessed in the geriatric population globally will fuel overall prospects for the market in response. With the evolution of technology, producers are looking to use advanced materials for manufacturing casts and splints. This subsequently is expected to boost sales of casts and splints worldwide. The market however is likely to get restrained by the unfavorable reimbursement policies, as per Transparency Market Research (TMR). Nevertheless, in the near future the presence of high unmet needs in emerging economies will present attractive opportunities for vendors in the market. TMR pegs the overall value of the global casting and splinting market at US$1.8 bn in 2015. The market is poised to reach US$3.1 bn by the end of 2024. Regionally, Asia Pacific has been exhibiting the highest prospects in the global casting and splinting market, followed by North America. Demand for casts and splints is visibly high in countries such as India, Korea, and China. The high incidence of osteoporotic hip fractures and road accidents in these countries has resulted in their lead in the Asia Pacific market for casts and splints. Many producers who manufacture affordable casting equipment in large-scale are domiciled across these countries thus gratifying the increasing demand in local and international markets. Furthermore, casts and splints are widely used in Asia Pacific, due to which, their price in the region is comparatively low. This has resulted in the increased demand for casts and splints and consequently has earned increased revenue for the region’s casting market. The regional market will also gain from the rapidly growing population in India and China. TMR finds the Asia Pacific market for casting and splinting stood at US$487.1 mn in 2014. Rising at a CAGR of 6.9% from 2015 to 2024, the market is expected to reach US$888.1 mn by the end of the forecast period. TMR projects North America to continue holding the second-largest share in the market during the forecast period. The increasing incidence of osteoporosis and musculoskeletal injuries in the region will aid expansion of the casting and splinting market in North America. The major products available in the market can be broadly classified into casting supplies and equipment and splinting supplies and equipment. Of these, the casting supplies and equipment segment held over 60% of the market in 2015. Castings are ubiquitous methods of treating bone fracture hence hold larger share in the market. The demand for casts is expected to surge at a steady pace due to the increasing number of traumatic and accident injuries. Demand from the segment will also rise due to the increasing osteoporotic geriatric population, particularly in countries with high population. The most common casting supplies and equipment available in the market include casting tapes, plaster casts, casting tools, and cast cutters. Of these, cast cutters held a share of 30% in the cast products market in 2015. Demand for cast supplies is expected to remain high through the forecast period. Companies such as 3M Healthcare, Stryker Corporation, BSN Medical GmBH exhibit the largest regional outreach with presence across diverse casting and splinting product categories. A few other prominent names operating in the market include AliMed, Bird & Cronin, Inc., Corflex, Inc., DJO, LLC, DeRoyal Industries, Inc., Orfit Industries n.v., Össur hf., Patterson Medical Holdings, Inc., Spencer Italia S.r.l., Stryker Corporation, and Zimmer, Inc. This report on the casting and splinting (supplies and equipment) market analyzes the current as well as future prospects of the market globally. Most individuals experience orthopedic or musculoskeletal injuries or disorders at least once during their lifetime. Most of the musculoskeletal problems are caused due to vehicular accidents, sports and adventure-related injuries and age related orthopedic injuries. Various casting and splinting products are used to treat musculoskeletal problems. 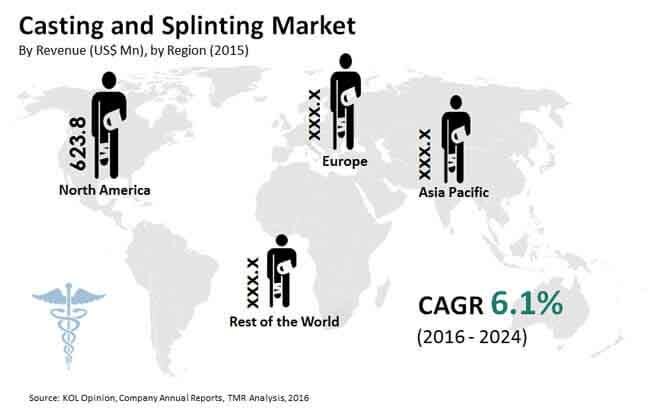 The casting and splinting market research report provides a detailed analysis of the casting and splinting (supplies and equipment) market and helps understand various driving factors for the growth of the market. The market overview section analyzes market dynamics and trends such as drivers, restraints and opportunities that influence the current nature and future status of the market. Porter’s five forces analysis has been covered in terms of bargaining power of buyers and suppliers, threat of new entrants and substitutes, and competitive rivalry in the global casting and splinting market. Value chain analysis and other market dynamics factors such as market attractiveness analysis have also been explained in order to deliver a thorough analysis of the overall competitive scenario of the global casting and splinting (supplies and equipment) market. This section of the report also includes key players’ product wise heat map analysis in 2015 for this market. The casting and splinting (supplies and equipment) market has been segmented into casting supplies and equipment, and splinting supplies and equipment. The casting supplies and equipment segment has been sub-segmented into plaster casts, casting tapes, cast cutters and casting tools and accessories. The splinting supplies and equipment segment has been classified into four major sub-segments: fiberglass splints, plaster splints, other splints (polyester, plastic, neoprene, metal, etc.) and splinting tools and accessories. The executive summary provides detailed insights about the report and the market in general. This elaborate executive summary provides a glimpse into the present scenario of the global casting and splinting (supplies and equipment) market, which includes a market snapshot that provides overall information of various segments and sub-segments. The executive summary also provides overall information and data analysis of the global casting and splinting (supplies and equipment) market with respect to market segments based on product type as well as geographic regions. The market for casting and splinting supplies and equipment has been extensively analyzed based on their usefulness, effectiveness, sales revenue and geographic presence. The market size and forecast in terms of US$ Mn for each product type has been provided for the period from 2016 to 2024. This report on the casting and splinting (supplies and equipment) market also provides the compound annual growth rate (CAGR %) for each market segment for the forecast period from 2016 to 2024, considering 2015 as the base year. Geographically, the casting and splinting (supplies and equipment) market has been segmented into four major regions: North America, Europe, Asia Pacific, and Rest of the World (RoW). The market size and forecast for each of these regions have been provided for the period from 2016 to 2024, along with CAGR (%) for the forecast period from 2016 to 2024. The research study also incorporates the competitive scenario in these regions. A list of recommendations has been provided for new entrants as well as existing players to help establish a strong presence in the market and increase market share. The report also profiles major players in the casting and splinting (supplies and equipment) market based on various attributes such as company overview, financial overview, business strategies, product portfolio and recent developments. Major players profiled in this report include 3M Health Care, BSN medical GmbH, DJO, LLC, DeRoyal Industries, Inc., Orfit Industries n.v., Össur hf., Prime Medical, Inc., Spencer Italia S.r.l., Stryker Corporation, and Zimmer Biomet Holdings, Inc.